Just for a little while! It’s been a string of warm sunny days in the Pacific Northwet. DH and I decided to get out for a bit on Sunday. Multnomah Falls was our original destination, but it was packed for the holiday weekend and we had to do a quick destination revision. 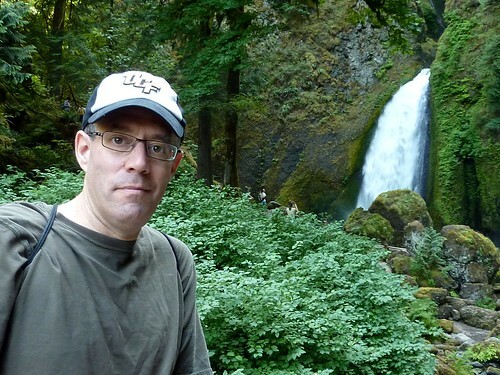 I remembered we had once hiked at Wahclella Falls, and the smartphone google machine pointed us in the right direction. Come on, you know you want to! 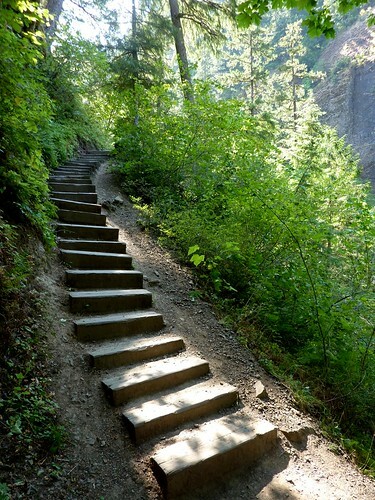 The hike is an easy mile in and mile out. We last did this with young kids, and it felt like many more miles back then. 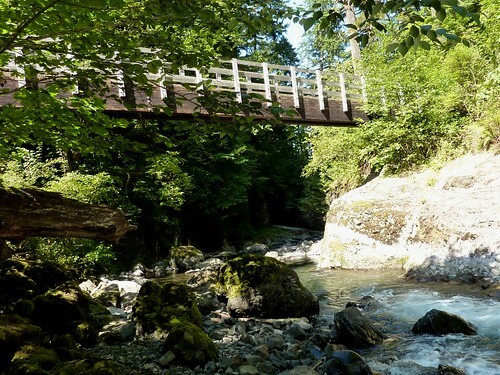 The trail goes alongside Tanner Creek, and has lovely shady spots to hang out. But the mosquitoes know you’re there. We didn’t linger at this spot. It’s not much further to the falls. It was cool and perfect on a hot day. And we enjoyed the hike out as well. When we got home, I looked for the pictures from our last trip here. Apparently it was 16 years ago. That tow-headed toddler? He’s a college freshman. The other kiddo? College grad, working dude. And DH on the left? Still DH, 29 years next week. Happy anniversary! What did you do with the end of summer weekend? 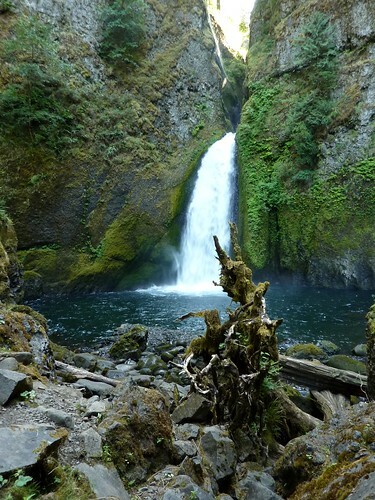 This entry was posted in travel and tagged wahclella falls. Bookmark the permalink. Gorgeous photos! I sat on my bum, watched tennis, and knitted. Not glamorous but it worked for me. Went to Oktoberfest, played with my horse and made in roads on my house cleaning but I just kept taking a long breaks to knit so it was more like knitting with breaks for house work! Beautiful fall and hiking spot. Handsome family. I dibbled and dabbled here and there, more dyeing, knit then unknit, cleaned house, stressed over the overrun plate of knitting self-imposed deadlines, getting the girls ready for school again even as part-timers! Luckily, I will be off the valley on Friday then to the coast mid-next week, for 5 days. Thanks for taking us along! I LOVE waterfalls, but there aren’t many around here. I ended summer with a lovely bike trip with half-a-dozen friends, followed by a potluck lunch. We had so much fun, we’re going to do it through the fall (at least that’s the plan!). Gorgeous pictures old and new. Congrats to you both on your 29 years too! 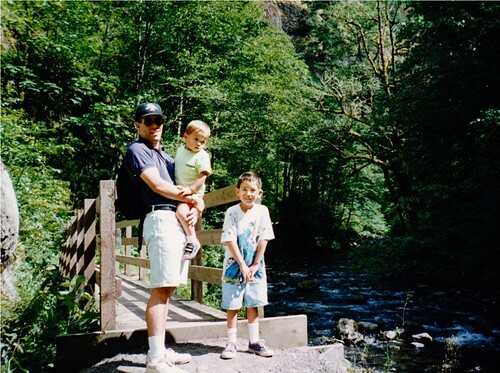 The picture from 16 years ago is precious!! 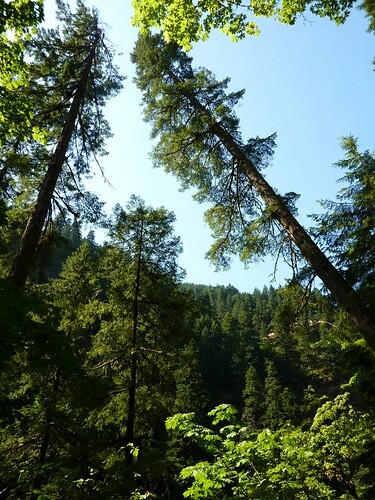 Your photos are beautiful — oh, I miss Oregon! (I lived in Salem for a few years) And happy anniversary to you next week! What a beautiful hike! 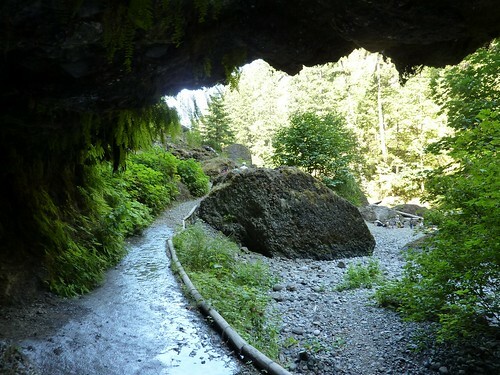 We never went there but seeing the pictures has brought back good memories of dating and the early years of marriage when Ed and I spent a great deal of time in the Gorge. 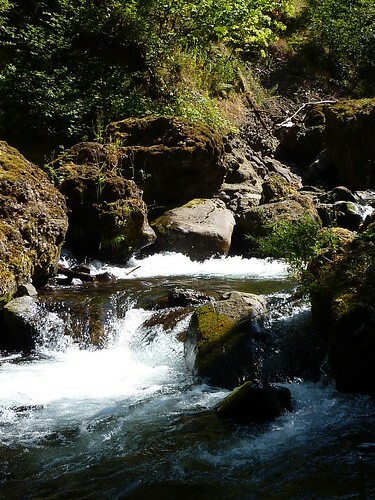 Lower Oneonta Falls was one of our favorite creek hikes. Oh wow, congratulations on your anniversary next week! The hike looked stunning. hey, I missed it this weekend but Park Silly Market was supposed to have “knitting graffiti” throughout last Sunday. I’ll check it out for you, Park City is kind of a cool place to live.